Well it looks like I’m riding 100 miles this summer. It had to happen eventually. After 6 attempts, I’ve finally won a place in the RideLondon 100 ballot. And gosh darn it I’m going to ride it. In fact I’m not just going to ride it, I’m going to train for it. One of my objectives for the Sportive Cyclist blog this year was (is) to write more about improving fitness by undertaking a more deliberate and structured approach to training. This now gives me the perfect opportunity to act as something of a test bunny as I explore these ideas. If I can fitter, faster and lose weight. If I can put in a strong performance on my first century ride in 5 years (note: strong for me). If I can successfully navigate past all the cyclists walking up Leith Hill. Then I reckon you can too. It’s time for Monty to hit the books. Research-a-go-go. Out comes my well-leafed copy of The Cyclist’s Training Bible. Perhaps a little Fast After 50. Some back issues of Cyclist magazine. Certainly the odd YouTube video. It’ll all be useful as I form the perfect plan. It needs to be a plan that I can execute. One that will fit in with my other commitments. One that builds progressively to the goal. One that won’t cause further injury to my knee. My first key priority is to sort my knee (or at least have line of sight on the practice I need to maintain to strengthen it and protect it as I increase my riding volume. I’ve been maintaining my daily habit of self-prescribed (and probably ill-chosen) core, glute and leg strengthening exercises. Whilst my knee is definitely improving, I’ve decided to get an expert opinion. I’ve booked an appointment with a sports physio who has a particular interest in running and cycling injuries. Whilst I’m not looking for a silver bullet (well, I am, but I appreciate there isn’t one), I’m looking for a structured programme I can follow that will result in tangible improvement. Hmm, I’m detecting a theme. Whilst I had grand plans to maintain the cycling habit throughout winter, the enforced rest period has put paid to that. I therefore need to build a ‘Preparation’ phase into my century training plan. In a periodised training programme, the purpose of the preparation phase is to break yourself in gently before commencing the more structured and increasingly intense ‘Base’, ‘Build’ and ‘Peak’ phases. If you’ve had a break from cycling, and perhaps exercise in general, over the past few months, I’d suggest you do the same. Interpreting that, I’d say we’re just talking about a jumble of relaxed rides of varying lengths. ‘Cross-training’ means a non-road cycling activity (so mountain bike, a run, football, parkour, kabaddi). Just do whatever feels right to get your groove back. Or something. The preparation phase, according to Friel, should be one to six weeks long, before moving into the ‘Base’ period of the training plan. Since I have my knee to deal with, and the fact that my knee pain was caused in the first place by ramping up my level of activity too quickly, I’ll be erring towards the longer end of that scale. Plus, six weeks gives me more time to crack out my coloured pencils and create that perfect training plan. Do You Fancy Riding A (First?) Century? 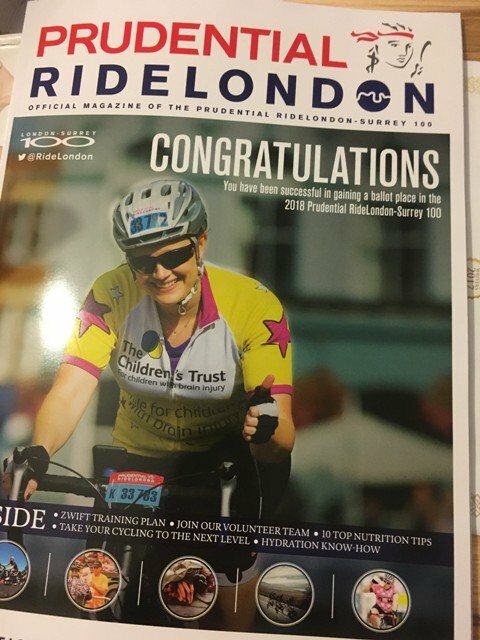 For those of you lucky enough to have received your RideLondon ‘Congratulations’ magazine this week, presumably you’ll be starting to at least think about training (or perhaps you’re conveniently blocking it out of your mind). If you didn’t get a ballot place, or you’ve only just realised a profound desire to ride a 100-mile event, you still have options for completing a century ride in 2018. There are plenty of charity places available for RideLondon. I rode RideLondon in 2013 for Macmillan. There is a page on the RideLondon website that contains details of all the charities with places. You’ll just need to commit to raising a certain amount of sponsorship money. Away from RideLondon, there are a number of 100-mile (or similar) sportives due to take place around the UK this summer. I’ve done a little research and picked out a few events that you might want to consider. If people would find it useful, I might even put a ‘100 Mile’ events page on the blog as a sort of reference. Perhaps non-UK-based readers could supply some good 100 mile events near where you live, in the comments below. Who’s Up For Riding A Century Sportive in 2018? It looks like a moment of madness next year has accidentally committed me to RidingLondon (100) in 2018. Now I’m actually pretty excited about it (well, as excited as an uptight Englishman can be). It gives me a focus for the year, in terms of improving my fitness and prowess on the bike, in terms of getting my knee sorted and in terms of providing useful information (I hope) on this blog. So, tell me. Who else got a place in the RideLondon ballot? Or have you since signed up for a charity place? 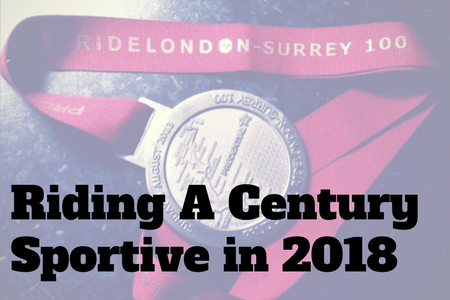 If (Ride)London aint your thing, are you doing any century rides this year? Perhaps the list of long sportives in my table above has piqued your interest (or you’ve got one to add)? Hope you’re luckier than I was in 2016. Averaging just over 15mph – not bad for a 67 year old – and got stopped for 2 hours by a crash ahead. Got to the bottom of Leith Hill and got stopped for another hour by another crash ahead. Was then diverted to keep within the time limit and missed Box Hill. Very disappointed that I had put so much effort into training, was going really well and didn’t complete full course through no fault of my own. But enjoy the ride. Leith Hill is not difficult, even for a lardy 67 yr old. One advantage of the delays was that I could really hammer down the hill because there were so few riders around. Rode this with a ballot place last year, missed out on the ballot this year but now have a charity place. Very impressed with all the organisation last year, thoroughly enjoyed the ride, helped by the advice and details here. Also a 67 year old but no delays for me, noticed a few accidents (which were well attended by medics, stewards). Took a long time to learn I didn’t need to cover the brakes when approaching red lights. Hills, mainly Leith hill, made more difficult by those walking all over the road. Carried my own food to avoid delays, especially at early food stations, only very minor disappointment was I couldn’t find anyone at the right speed for the last 20 miles or so to work with, but riding along the right hand side of the road along the Embankment still a real thrill as was the crowd support throughout. Congrats on securing a spot! A couple years ago, I committed to riding a solo imperial century every year around my birthday (I’m 54.) I’m not a fan of riding in crowds, but I sure miss the buffering effect when the winds blow of the lakes on my route. Doing my first ride 100 this year with a charity place never had a ballot place in 6 tries (my boss had 6 out of 6) done the first ride 46 that was great. Started training in January first rides after knee op and now my backs gone. (so not sure if it’s safe to ride) I’m using leith hill to train as only 20 minutes ride from home and box hill is 5 minutes from work, so the climbs hopefully won’t be a problem come July. Any training tips would be great as training by myself is boring. For all you Poms (no offence) who have relatives/friends in New Zealand or just want to escape the northern hemisphere winter, the ultimate cycling sportive is the Lake Taupo Cycle classic. Sadly last year my car blew up on my journey to the event so my registration and accommodation which I had booked 11 months earlier were wasted. Congratulations on your place, I missed out on the ballot but got a charity place for Ride London, my first century. Very excited about it all. I’ll be 54 when I ride it, but have done Box Hill several times now and Leith Hill once (will do it a couple more times before July). Still most worried about not being fast enough and missing some of the cut offs and being diverted to the shorter route. All training tips much appreciated Monty. Having nether got in through the ballot decided to do the 2016 ride london though a charity place.I did it for prostate cancer uk a Charity dear to my heart. I was 63 at the time and the training i put in beforehand ensured that leith hill and box hill wasn’t a problem. There was a long delay just before leith hill because of an accident and i was worried that i wouldn’t be allowed to do the whole course but luckily that didn’t happen. A great event but unfortunately i failed to get in for 2017 and 2018.Here’s hoping for 2019.? Well done on your place I got into the ballot last year after not being successful in 2016 but didn’t get a slot this year:( I am in two minds whether to go for a charity place or not. I really enjoyed it but the training did take over a little, however it paid off as I was aiming for 7 hours and made it in 6:39 moving time which I was pleased with. Leith Hill was the only issue and that was due to no space to cycle up……..just down to the volume of people, so everyone was walking up for a while. I need more structured training so will be watching your (and my) progress. The feed stations are the stuff of legend, featuring heaps of locally sourced produce. I’m in this year as a charity place – I’d arranged this last year to support Crohn’s & Collitis UK a charity that is close to me personally and means a lot to my family. I was lucky enough to get a place in the ballot this year. I did it in 2015 and got stuck at the bottom of Leith Hill for an hour because of an accident. The hills weren’t as bad as I thought they would be and it was great to cycle on car-free roads – I particularly enjoyed cycling on Hammersmith flyover! Blimey!! Have I got to have six attempts to get into the Ride London before I’m successful? So far I’ve missed out twice, but I’m not sure my knees will still be any good in another four years! I was fortunate to get a place in London after numerous attempts but due to cash flow issues having to postpone until next year, but get a guaranteed place! Doing the Ochil 100 sportive in June, but due to the horrendous winter we have had In Scotland and the fact I fell off my bike at the end of January and off bike until last week, I’m struggling to get training in. Desperate to do my first hundred though, so will get the miles in over the next month and hopefully I will pull it off!